Innovative design and new technology, at the talented hands of Dutch designer Cor D. Rover, has paved the way for Horizon to develop an exceptional Raised Pilothouse concept: the RP102. The Horizon RP102 project features a combination of fluid lines and modern proportions, large glass windows allow natural light to flow into the interior spaces, and her layout offers a symbiosis of owner, guest and service areas, creating the feeling of a much larger yacht. A full beam master stateroom is located on the forward main deck, complete with an en-suite bath. Equally impressive are the RP102's exterior areas; at the touch of a button, the RP102's Sky Terrace, a patented design by Rover, can increase the flybridge deck area by 20% without compromising the yacht's fluid design. A beach club forward of the swim platform offers a space ideal for enjoying the ocean view that is also protected from the sun. Horizon utilized Computational Fluid Dynamics and scaled model tests to successfully develop the RP102 hull form, which provides 25% less fuel consumption at a 20-knot cruise speed than a conventional planning hull. 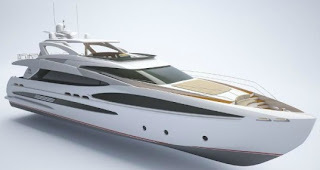 Horizon RP102 concept design is answer to consumer demand, emphasizing luxury, safety and interior volume within a dual purpose, performance-oriented hull.